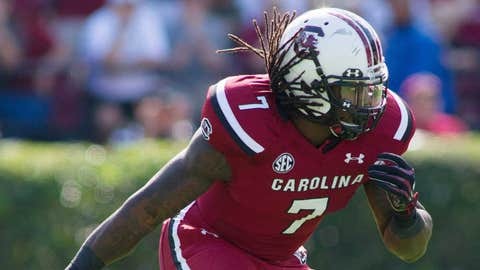 South Carolina Gamecocks defensive end Jadeveon Clowney pursues the ball during the first half against the Mississippi State Bulldogs at Williams-Brice Stadium. NEW YORK (AP) — A record 98 underclassmen, including Johnny Manziel and Jadeveon Clowney, have made themselves eligible for the NFL draft in May. The league released the list of early entrants Sunday and said the number has risen six straight seasons. The deadline for underclassmen to apply was Jan. 15. Last year, 73 underclassmen entered the draft. The year before it was 65 and in 2011 it was 56. Also, four players who recently graduated and still have eligibility left are joining the draft class but aren’t included in the number. Most notable among those is Louisville quarterback Teddy Bridgewater. Southern California defensive back Dion Bailey, Arizona State linebacker Carl Bradford and Alabama linebacker Adrian Hubbard are also juniors who have informed the league they have graduated. Among the early entrants expected to be selected near the top of the draft are Manziel, the Texas A&M quarterback, Clowney, the defensive end from South Carolina, and Clemson receiver Sammy Watkins. BROWNS WILLING TO TRADE UP FOR MANZIEL? The draft is May 8-10 in New York. LSU for the second straight season had the most players of any school to leave early. The Tigers had seven early entrants this season, including wide receivers Jarvis Landry and Odell Beckham Jr., after 11 LSU players left early last year. Alabama and Southern California each had five leave early, along with California. Cal, which went 1-11, has six players listed among the early entrants, but that includes defensive end Chris McCain, who was dismissed from the team in September. National champion Florida State lost four players early, including All-America defensive tackle Timmy Jernigan and receiver Kelvin Benjamin, who caught the winning touchdown in the BCS championship game against Auburn. Notre Dame, Florida and South Carolina also had four early entrants.